Wonderful play by play description anchoring the whole experience of what I think is a wonderful piece. Enjoyed your dance with the monkey. Thank you Danny. Thank you for sharing your struggle with this drawing and the process of recognizing the struggle’s value. Similarly, watercolor is hard in that it looks best when I put it down right the first time and leave it alone, especially when the ink work is busy. Leaving it alone while it dries is a real challenge. I want to do something to it but instead, I’m trying to walk away. You just make me laugh out loud, the tone of your voice, so casual, the magnet for weirdos, “quite honestly, I was just overly ambitious”, being distracted by the people watching, having fun, and then ultimately being able to appreciate the charm in your drawing. It is totally charming, and I can’t wait to do my drawing this weekend of a similiar spot! Love seeing your process, your struggles, and your charming, creative result! I, too, appreciated seeing your experience…how the drawing and your reactions evolved. I was perplexed by those odd snakes and metalwork around the shop until at one point, your camera came in closer and I noticed the entire metal work is made of KEYS! Astounding! What wonderful urban artwork and appropriately funky storefront for an unglamorous work-store located in the Villiage. I really got a chuckle when you described this store/place as a magnet for weirdos…because…well…there YOU were! Just noting, picturing, and taking in the scenario. Oh wow I didn’t even notice the keys! Loved to see you struggle through a drawing. It normalizes difficulty which is helpful since I always think it’s just me if I can’t get it right. I was inspired by some of the scenes which I paused & drew for fun. Thanks for taking us through your process. Edifying. What a pleasure to watch your video! Oh that monkey on your back was giving you a hard time! Bad monkey. I love comment # 6, yes, YOU were there! I really liked how you made the video And incorporated the photos of your drawings and, of course, your art supplies – which is always a must! And last but not least, the sound effects of the police car that you cleverly incorporated into your video. Nice touch! I used to live on 1St Ave. and 80th street. Ugh, Upper East Side. Anyway, the traffic noise was sooo bad I could barely make phone calls to loving family in the Minnesota. 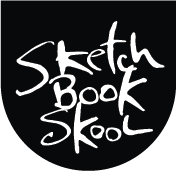 Thank you for another fun and enjoyable Episode of Danny Gregory at Sketchbook Skool. I have always loved the look and feel of pen and watercolor wash sketching but have yet to do any! I noticed that you have the same Winsor&Newton pocket pallette I currently have 3 of them I just bought a 14 color Winsor&Newton pocket pallette just a bit bigger in size. I really like the pavement the whole scene is quite engaging. Great video! It’s so interesting to hear all of your thoughts and see the full process.